That's one of many things that popped into my head after watching Bates Motel Season 5 Episode 4. If only things were different for Norman, imagine how his life would be. One of my favorite scenes of the whole hour was Norman and Madeleine in the shop with him watching her hold the baby. He had such a look of content on his face then and in the car on the way home. His genuine smile and laugh grabbed my heart. How could you not feel for the guy? Had things been different he could have had a wife and child of his own. He could have had a happy life. There's a super tiny part of Norman that is still normal; it's heartbreaking to watch when it all goes downhill. But moments like those between him and Madeleine really make it seem like there was still hope for him. Sure, there was the whole Madeleine getting her throat cut moment, but that wasn't Norman. It was his crazy mama who we knew deep down was just going to ruin the evening because she really can't help herself, can she? 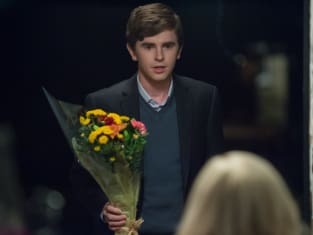 Wouldn't it have been lovely if Norman could have had one night of happiness? Just one? So what if Madeleine is married. Nothing is perfect and certainly nothing in Norman's world. I loved how he tried to talk to Mother before he left to to convince her to stay away for the night. You have free will. So do I. You do what you're gonna do. I'll do what I'm gonna do. Permalink: You have free will. So do I. You do what you're gonna do. I'll do what I'm gonna do. Mother was a little cocky about it, but it did seem like she was going to listen. The cake making scene was incredibly romantic and full of sexual undertones. Don't tell me none of you felt something for Norman and Madeleine, two lost souls, looking for love and acceptance. I so wanted them to just fall onto the kitchen table and make mad passionate love to each other. They both needed and deserved that moment. Mother wasn't going to have any of it. She made her presence known as we knew she would. Well, okay, I was hoping she was going to listen and stay away, but I guess I'm a dreamer because it didn't happen. I'm just glad Norman booked out of there before Mother took full control of the situation. As it turns out, it seems Mother has taken full control. Period. 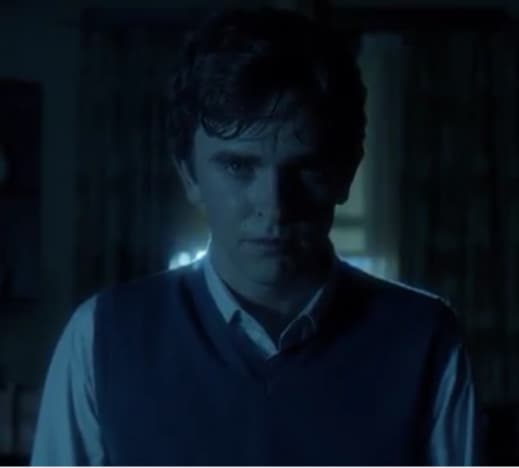 Did anyone else get some serious chills when Norman was at the kitchen table after searching the house for Mother? You could just hear his mind snap completely when he realized what was going on. Goodbye Norman. We'll miss you. But we knew it was coming, didn't we? Even in the woods when Norman and Mother were looking for Blackwell's car, there were little hints like when he choked her, and we saw those cloudy, dead eyes. She was dead again, but then she woke up. She'll never leave Norman. Never. Such hopeless romantics like myself need to give it up because it's over. Mother is in complete control now. Norman isn't the only cuckoo in town. I didn't know whether to laugh or cry at Caleb's sendoff. It was completely bizarre but very Chick-like. Who else would dress up the way he did? You have to give him credit, though, he got rid of the body and did it in a rather tasteful way considering their past. But you have to wonder if he was just dramatizing the whole thing so that he could add it to his "suspense novel." I laughed out loud when he told Norman about his book. If only Norman knew the truth behind it. I was a little worried about Norman kicking Chick out of the house. Chick was looking forward to his new digs, and he wasn't very happy when Norman told him no. 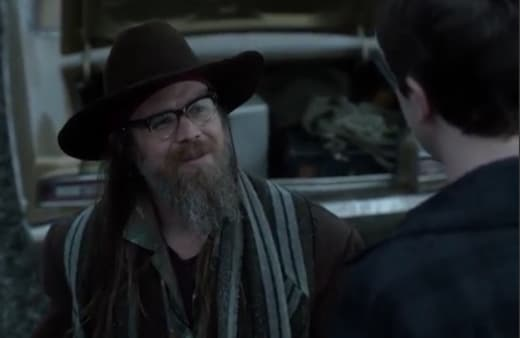 He could make Norman's life miserable, but now that Mother is in control we know Chick's days are numbered. One threat from Chick and it's all over for him. Mother is not going to be tolerating much of anything going forward. Romero survived his gunshot wound and ended up at a friend's house. He's determined to get to Norman, but we already know how that's going to go. It's just a matter of how it's going to happen. It would be much better if Romero would just die from his gunshot wounds rather than the violent way it'll end at Mother's hands. No matter how much she loved Romero, he doesn't have a chance. There's no hope for him. It's also unclear how it will end for Sheriff Green. She's asking lots of questions, and Mother isn't going to like it. I don't think she's long for this world either, but you never know. Mother can't kill everyone who gets in her way. What did you think of "Hidden"? Has Mother completely taken over Norman's life now? Is Madeleine safe? How do you think Chick and Romero will fit into all this? Hit the comments and share your thoughts! Sheriff Green: Hello, Norman. Pretty night, isn't it? Norman: Oh yes, Sheriff. Isn't it just? Permalink: Oh yes, Sheriff. Isn't it just? Mother: What the hell crawled into your pants? Norman: I don't like how things are. Mother: Mmm hmm. Well, neither does anyone in all of God's creation. We are a species of complainers. What makes today so special? 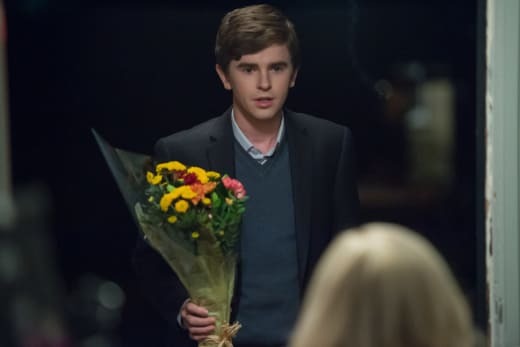 Norman: Because nothing ever happens the way that I think it should, Mother! Permalink: Because nothing ever happens the way that I think it should, Mother!